How to Store your Potato Crop so it Will Last the Longest! 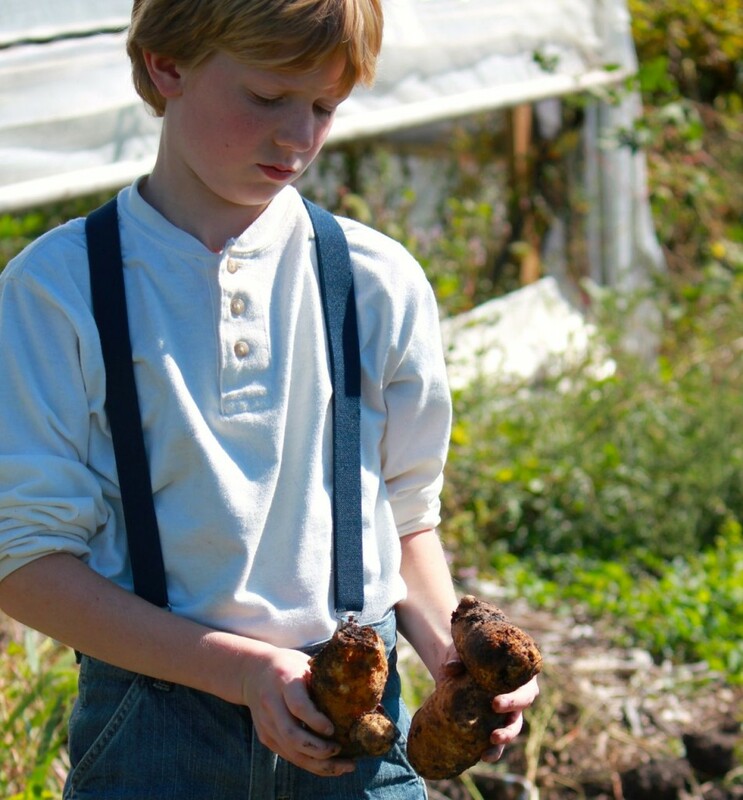 Growing plenty of potatoes for winter meals is a smart and relatively easy thing to do. 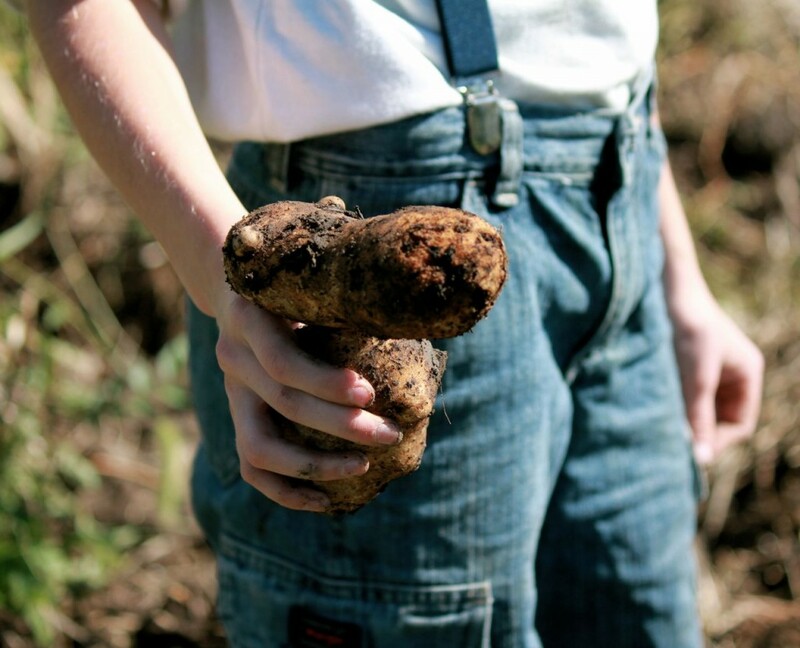 If you harvest and store your crop correctly, you can serve your own potatoes–mashed with butter and cream, tra-laaa–with your Easter dinner. But if you don’t take the proper steps to cure your precious crop, you might be left with a stinky awful mess (nothing stinks like a rotten potato!) and no potatoes left even to serve with the Christmas goose. Does this sound like the voice of experience, Gentle Readers? That’s because . . . it is the voice of experience: that painful, humiliating voice of experience. 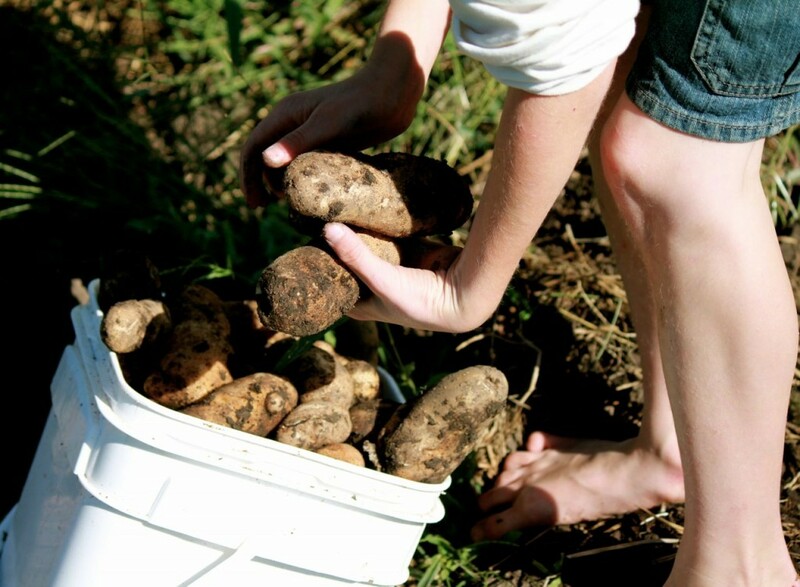 Did you know that you need to cure your potato crop before you sock it away in your storage boxes or bins? Well, now you do. Did you know that it’s easy and quick to do so? Well, now you know that too. *curtsy* You’re welcome, I’m sure. But I’m not going to leave you hanging with only partial information. I’ll reveal all, in moments. Little Mack and I still have a few days of digging potatoes, as a matter of fact, and we dig a bit more furiously as we get closer and closer to our first frost date. Last year I planted no potatoes (how did this happen? Probably because I was so busy planting four kinds of basil and four varieties of kale and sixteenhundred tomato plants, maybe?) and I missed them so sorely in my root cellar all winter long, that this year I planted lots and lots and lots of potatoes: nine rows! Nine rows of potatoes. That’s a lot of potatoes, at our place, at least twice as many as I usually plant. I took good care of the vines, too, patrolling them daily for potato bugs and schussing up (please, can’t I use this word this way, just this once?) the woodchips and straw to cover the vines as they grew. I did everything right by my potato crop this year, for a change. Hard truth: my potato patch is usually an area of neglect. But not this year! My tender care was not lost on the potato plants, either. They were beautiful and strong and grew in stature and beauty unlike anything else. I’d never seen such lovely and strong plants! I knew that I was going to end up with the most amazing potato harvest, ever! I was so happy. It’s such a pleasant thing to have something go right in the garden, isn’t it? And then. Gentle Readers. That week happened. That week in July when my second grandson (Wesley) was born, and my heart flew out the roof in ecstatic cartwheels when my sweet son called and asked “Mom, can you come? *” and all practical matters about keeping a garden and potato bug removal and lovely harvests and so forth were instantaneously forgotten (you understand, you grandmas). I packed up a few things, told Amalia and little Mack to pack their bags, and we drove to St. Louis. *There was no such call when the first grandson was born, since apparently there is a more urgent sort of need for Grandmas with a second baby, than with a first. I understand this now. As we drove down the driveway, the grasshoppers (I’m pretty certain about this) promptly set up their luncheon buffet in the potato patch (this was before the Icelandics were big enough to clean the ‘hoppers up for me) and by the time we returned, the plants were nothing but sad-looking, leaf-bare stems, sticking out of the straw. Bewildered. Naked. Defeated. I was so astonished. I stood in my potato patch with my mouth open for so long, staring at the devastation, that a garden spider contemplated making a nest in my gaping maw. Where did my lovely potato plants go? How could this have happened in such a short time? We were only gone for–what–six days? It. Was. Unbelievable. Of course, every grandma worth her salt knows that seeing baby Wesley so fresh and new, and accompanying the displaced Prince, Emmett, the tippy-toeing, truck-clutching, belly-laughing older brother, to the zoo and to the park and to the other fun places so Mama and Wesley could rest In Peace And Quiet, was worth buying potatoes for this year. Really, no comparison. None. But still. With that disappointing grasshopper coup, I wasn’t so hopeful about the potato crop. The plants were, after all, cut down in their prime. It could have been a massive and noteworthy harvest, I just knew it. But it was not to be. Not this year. I knew there had to be potatoes under there, and after I got over the bitter lump of resentment against those grasshoppers, I dragged my reluctant Little Mack out there and we started digging. And we found potatoes. Sure, they’re not as big or as plentiful as one might hope, but we’ll still have plenty for the winter. As long as we cure them correctly. So little Mack and I have been digging our potato crop, row by row. Every day after school, we grab a 5-gallon bucket and a potato fork, and we go out to the garden and I dig while my son talksandthrowspotatoesoverthehoophouse picks up the purloined treasure and drops it into a bucket. When the bucket is full, we stop, and we bring the potatoes in and do the magical curing thing that will mean the difference between our potatoes staying in great shape all winter long, or rotting in sorry disgrace. The Magical Curing Thing: THE secret to successful potato storage! Find a dark, cool, dry spot (we chose the basement ping-pong table) and lay out newspapers and/or cardboard. 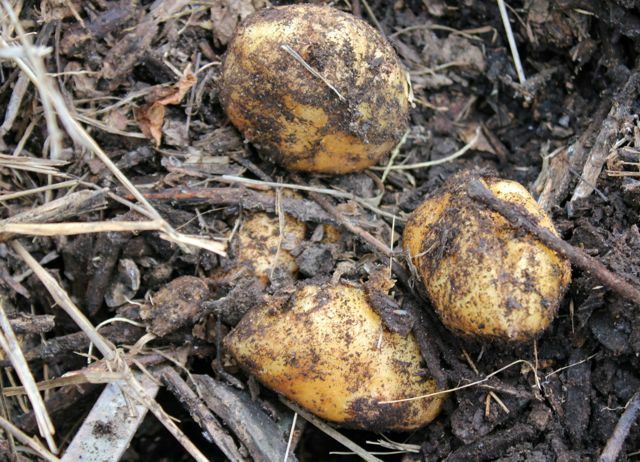 Carefully sort the potatoes that have scuffs or holes or damage (from the fork) and take them straight to the kitchen for eating. Mashed potatoes are always a big hit at our place, for example. Lay out, in a single layer, the potatoes that are unblemished. Stand back and admire your work. Cover with old sheets or newspapers against the light, if there is light in your dark corner. Leave for about 2 weeks, until the skin is dry and tough. Check now and then. Brush off larger clumps of dirt (do not wash) and store. Oh yeah. These are so cute. And you can dig through them if you smell something suspicious–not that you will–not now that you KNOW. That’s it, Gentle Reader and fellow potato-grower. 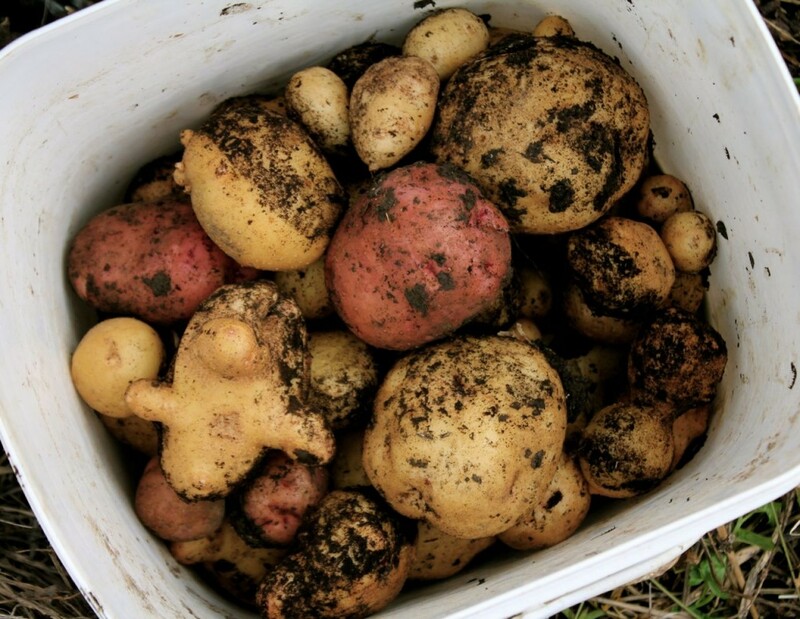 Did you harvest enough potatoes this year to store some for winter use? I’d love to hear about your gardening adventures in the comments. ← Make Roasted Cherry Tomato Pasta Sauce: It’s a Cinch! I think potatoes are beautiful! So simple, so dirty at first, and like snowflakes, each one different. And besides, they taste delicious! I agree, Robin! And they are super-easy to grow! Great information. I do not have potatoes on the schedule this year. The Irish side of me is very upset about that. Between the farm and the home garden, I do have enough room. Perhaps I can dig in and find out more information on the in’s and out’s of planting the crop and then, maybe, just maybe I can try it here in Mexico…It might be too hot in our area. I’ll ask around, Nice thing is there are a lot of “old farmers” it’s just a matter of finding the right one to talk to. So much rice is eaten in this country that anything you do with a potato is like magic to most of your dinner guests. Potatoes ARE magical, Chef, and I don’t think it’s just my Irish blood (do we ALL have Irish ancestry?) that asserts this. You can do so MUCH with them, and homegrown ones (natch) are just the best. Any time there’s some study or new diet theory or whatnot that slams the potato, I studiously ignore it. I just love them. Now I’ve got a date with little Mack to dig another row. 🙂 I’d love to hear what you learn from your “old farmers.” They are just the best. I just love the injection of your new grand baby story during the potato harvest! It is SO TRUE that best laid plans can get waylaid like that. But it is also true that no garden is more important than a new baby . I hope your son’s family is getting along well now. Thank you for the best descriptions (always) of how you do things and why! I’ve never tried to grow potatoes but I’d like to try. Could you post some instructions about the planting (how, when, etc.) or point me in the direction of where you’ve already talked about this subject. I’m new to your blog and I just ❤️ It and your writing style too! All the best to you & your family. Thanks! I tell you, Lisa, potatoes are one of the easiest crops to grow, I promise! The only trick (for me) is to keep hilling up the dirt around the plants as they grow (okay, there are two tricks, at least here in Nebraska) so the roots are as far underground as possible (that’s where the potatoes form!) AND to make darn sure the potato bugs (or the grasshoppers!) don’t decimate the plants when you’re not looking! I’ve just begun a “how to grow potatoes” post just for you, and I’ll get it into my posting schedule in late winter–when the seed potatoes are in the stores–just for you! What area of the country do you live in? Thank you for your kind words. They are music to my eyes. <3 all the best to you and your family, too! true…once you grow your own, you’ll never go back to store-bought . i love buying seed potatoes….so many varieties, so little room. this year i added “magic molly”, a fingerling, to my repertoire. at the harvesting of one plant, i was stunned at the potato’s beauty…a gorgeous near black unblemished purple skin. i gave this batch to a friend, so proud i was to share the perfection. since most of the remaining plants are nice and green, i’ll leave them in the ground to grow a little bigger. my biggest accomplishment, however, was my first attempt at growing sweet potatoes up here at the 47th parallel. i was truly nervous as i gingerly dug away the soil…would there be any? …yes!! “violetta”…the nicked ones are the sacrificial lambs. reading all i could about “curing” these beauties, i am daunted, but undeterred. the question remains…”will they last long enough to provide me with slips come next spring?” blessed be the learning curve. Christy, I believe I’ll have a bumper crop of sweet potatoes, too, so any hints on curing them, I would appreciate! Wow, those “magic molly” potatoes sound wonderful! Where do you get your seed potatoes? My Scottish grandfather taught me that potatoes must lie in the sun for a day or two to make it through the winter. I wonder if that was true. I live on very sandy soil and potatoes don’t like this much. Rita, I was always taught to toss a towel or something over them, so the skins don’t turn green!